Noted: There are 2 questions (25, 26) were updated in 11 March, 2018. What service defines the protocols and technologies that implement the transmission of voice packets over an IP network? VoIP is a technology that converts analog voice signals into digital IP packets that can be sent over an IP network. What information about a Cisco router can be verified using the show version command? The value of the configuration register can be verified with the show version command. A newly hired network technician is given the task of ordering new hardware for a small business with a large growth forecast. Which primary factor should the technician be concerned with when choosing the new devices? Which network design consideration would be more important to a large corporation than to a small business? Capture traffic on the weekends when most employees are off work. Only capture traffic in the areas of the network that receive most of the traffic such as the data center. Capture traffic during peak utilization times to get a good representation of the different traffic types. 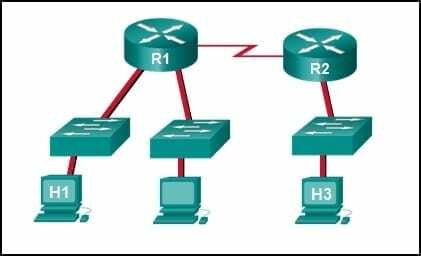 Perform the capture on different network segments. Only capture WAN traffic because traffic to the web is responsible for the largest amount of traffic on a network. Some routers and switches in a wiring closet malfunctioned after an air conditioning unit failed. What type of threat does this situation describe? Which type of network threat is intended to prevent authorized users from accessing resources? Which firewall feature is used to ensure that packets coming into a network are legitimate responses initiated from internal hosts? What is the purpose of the network security authentication function? A network administrator is issuing the login block-for 180 attempts 2 within 30 command on a router. Which threat is the network administrator trying to prevent? What is the purpose of using SSH to connect to a router? It allows a router to be configured using a graphical interface. It allows a secure remote connection to the router command line interface. It allows the router to be monitored through a network management application. It allows secure transfer of the IOS software image from an unsecure workstation or server. Give the router a host name and domain name. Create a banner that will be displayed to users when they connect. Generate a set of secret keys to be used for encryption and decryption. Set up an authentication server to handle incoming connection requests. Enable SSH on the physical interfaces where the incoming connection requests will be received. Refer to the exhibit. Baseline documentation for a small company had ping round trip time statistics of 36/97/132 between hosts H1 and H3. Today the network administrator checked connectivity by pinging between hosts H1 and H3 that resulted in a round trip time of 1458/2390/6066. What does this indicate to the network administrator? Connectivity between H1 and H3 is fine. H3 is not connected properly to the network. Something is causing interference between H1 and R1. Performance between the networks is within expected parameters. Something is causing a time delay between the networks. When should an administrator establish a network baseline? Refer to the exhibit. An administrator is trying to troubleshoot connectivity between PC1 and PC2 and uses the tracert command from PC1 to do it. Based on the displayed output, where should the administrator begin troubleshooting? A network administrator for a small campus network has issued the show ip interface brief command on a switch. What is the administrator verifying with this command? A network technician issues the arp -d * command on a PC after the router that is connected to the LAN is reconfigured. What is the result after this command is issued? The ARP cache is cleared. The current content of the ARP cache is displayed. The detailed information of the ARP cache is displayed. The ARP cache is synchronized with the router interface. A network technician issues the C:\> tracert -6 http://www.cisco.com command on a Windows PC. What is the purpose of the -6 command option? It forces the trace to use IPv6. It limits the trace to only 6 hops. It sets a 6 milliseconds timeout for each replay. It sends 6 probes within each TTL time period. 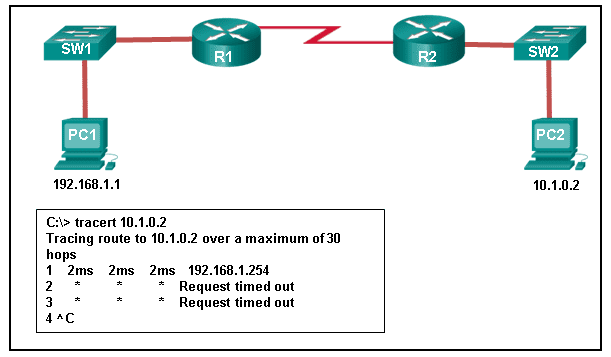 Which command should be used on a Cisco router or switch to allow log messages to be displayed on remotely connected sessions using Telnet or SSH? VoIP defines the protocols and technologies that implement the transmission of voice data over an IP network.